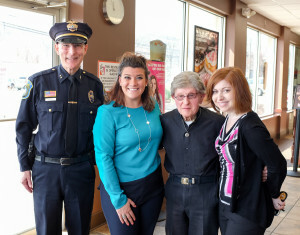 NEW BRITAIN — On a sunny day before Easter, Milton Ward sat with his friend Police Chief James Wardwell to have a coffee at the Dunkin’ Donuts near his home. “I never gave much thought about the police, but they are very caring, I love them,” said the 93-year-old, longtime city resident. The two met in October after Ward wrote to the chief about a problem he was having with driving. Wardwell wrote back and sent Lt. Benjamin Murphy out to Ward’s home to check on him. The chief and Ward have been exchanging letters ever since with Wardwell stopping by the older man’s house on occasion to take him out for coffee with other officers or with his executive secretary Kristen Perugini. Ward, who was an Army Pfc. was happily surprised when the chief and other high-ranking city police officers showed up at his home on Veterans Day after making the rounds to all the ceremonies in the city. “The last stop of the day we dropped in on Milton,” Wardwell said. They’ve also had coffee at Ward’s house where he showed the chief his military service medals. Just before Christmas, the chief stopped by with a photo from the Veterans Day visit. Wardwell slipped Ward an Easter card as the two sat to talk with Perugini about their friendship and discuss Mayor Erin Stewart’s pending arrival to join the group. Ward has recently added Stewart to his pen pal list. In his letters he talks about his late wife and the son he recently lost, the chief said. He also talks about his appreciation for the city’s Police Department; “New Britain is lucky to have these officers,” Ward said. Ward served his country with honor, was married for decades and raised children in the city of New Britain, the chief said.”You’ve done so many things right to deserve wonderful friends,” he told the older man. Ward then proudly showed off a locket given to him by his godson after his wife of 68 years passed away. Inside is a photo of Cora Ward who he met when he bumped into her while ice skating. The couple wound up living in the area of New Britain where Stewart grew up. “Did I deliver papers to you?” she asked when she arrived at the coffee shop. “You were my paper girl and now you’re the mayor,” Ward pointed out. Stewart said it has been a pleasure to exchange letters with Ward who is a longtime resident. Stewart and Ward chatted about her old neighborhood and she shared a story about how she fell off her bike and scraped her entire face on the pavement. “It was a good neighborhood,” she said. Ward said he kept writing to Wardwell because he appreciated what the chief did for him.